This project has been a long time in the making. The shop I work at got this really fancy yarn, an alpaca/merino blend that was just the right amount of slightly fluffy and kind of had me drooling. I eyeballed it for a year or so and then it went on sale! Combined with my employee discount this made the whole thing way more affordable, so instead of my usual buy-just-enough-to-make-a-hat-tactic I splurged and got enough for a shawl. I had this one in mind, in black and white. Super stoked, I looked up how to do intarsia and got started right away! I hated how it looked. The wrong side of the shawl shows so it has to be super tidy, and even though it didn't look awful I knew I was never going to like it. Frog, sulk and think. I then decided a scarf or shawl wasn't the way to go. I got moar yarn and decided on a sweater. 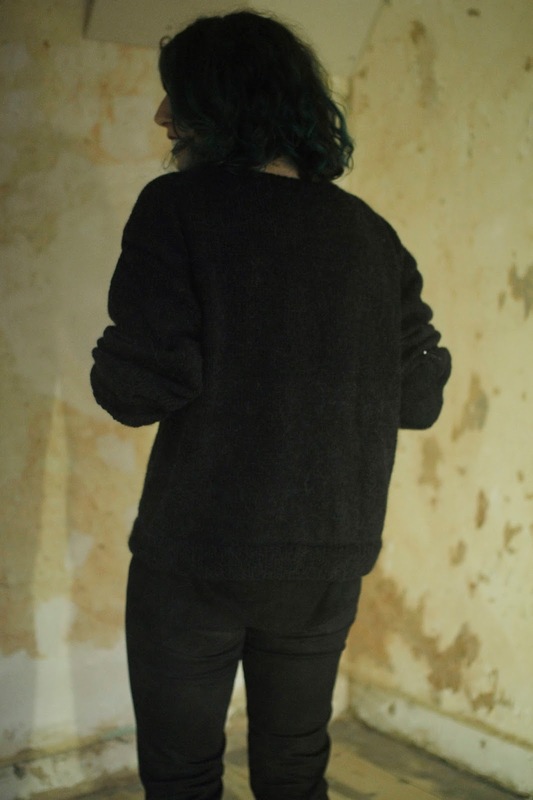 A black sweater with a ribcage on the front. 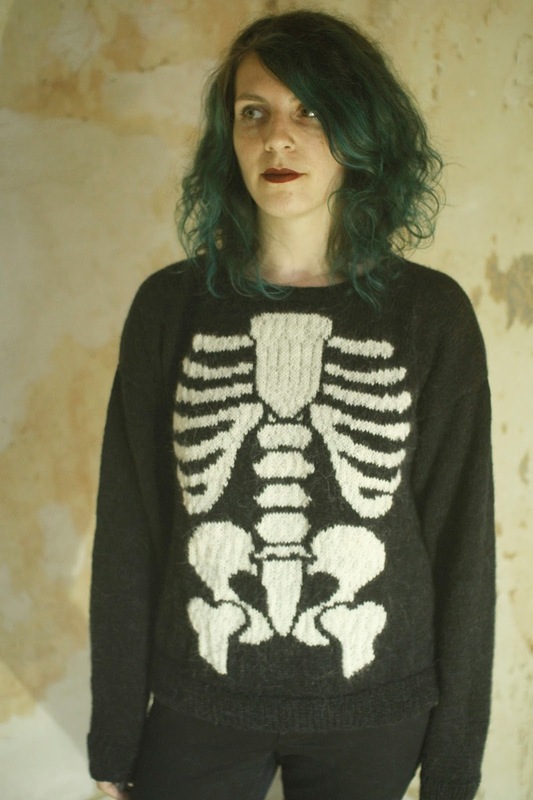 Because what goes better with fancy yarn than pictures of bones? Finding this (free!) skeleton chart wasn't the end of the saga though. 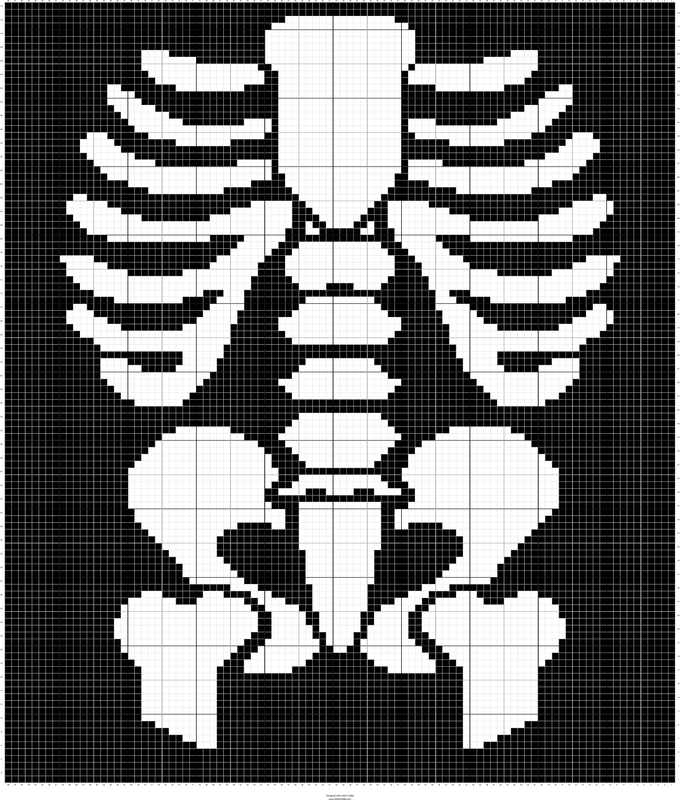 The chart itself was really low quality, so I copied it in Stitch Fiddle to get a larger version (I'll post it at the bottom but beware, there's a mistake somewhere in the ribs so it's not entirely symmetrical and I can't be bothered to fix it). Chart problem solved, I found out that I did not like the pattern that came with the chart (by which I mean I didn't understand it very well) so I looked for a pattern for a super basic sweater and used that instead. This bit about using two different patterns and files is going to be important later on. I got started, and quickly decided to carry my yarn along at the back to avoid having to weave in ten million ends later. This made the skeleton pucker a bit because my tension wasn't always awesome but I don't care because I didn't have to weave in ten million ends. After a while I got worried the sweater was going to be too small. When holding it in front of me it looked like it was going to be really fitted, which would look... Strange. So I started over and chose a size large. Yep, because I was so focused on the chart I completely forgot there was another file with an actual pattern I had to follow. BUMMER. 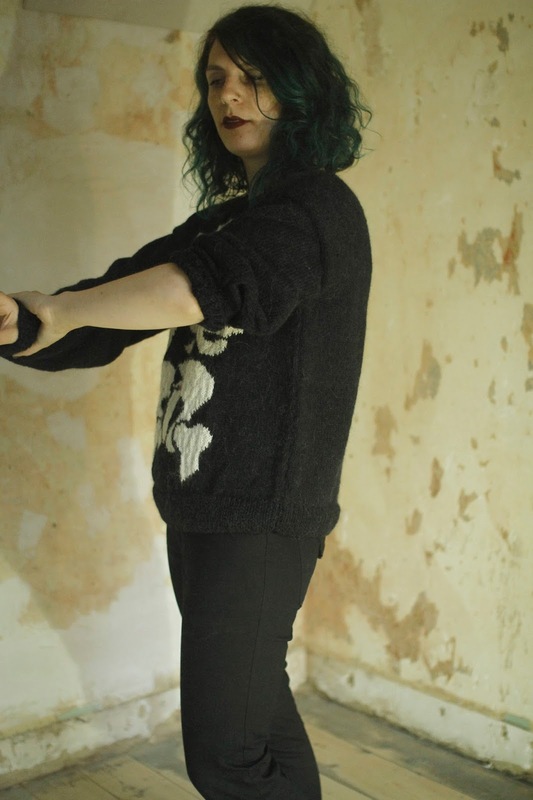 At this point there were three options: rip everything back to the point where the armholes should have started (urgghh), keep it the way it was and modify the sleeve pattern so it would be a dropped shoulder (so trendy) or cry. I chose the second option and knit the back the same way as the front, meaning I had two rectangles with a neckhole. This also meant I had to eliminate the sleeve cap shaping (what a shame) and kind of guess how long the sleeves had to be (I got a bit too cautious, thinking too long would be better than too short, and they cover my hands now. They are also super wide so I can easily get super muscular now. YAY!). After finishing all the separate pieces I blocked them, and realised things were looking... Big. I either overestimated my own size or everything grew during the blocking process, but this definitely went from 'slouchy' to 'I can smuggle an entire candy store into the movie theatre'. But you know what? I love it. It's warm and soft and cuddly and just the right amount of fluffy, and I'm going to be the spookiest skeleton all winter. PS: If you're wondering why I'm standing in this weird room with all the smoke and lipstick and stuff... I was helping Hanne with something for her next lingerie collection. It's going to be awesome, so you should all keep an eye on what she's up to! I mean, SMOKE MACHINE! I Made Stuff You Can Own!